Attention everybody! 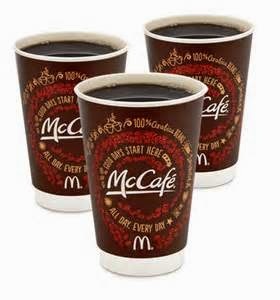 Due to slow sales (and not to mention its declining stock price...stock ticker symbol MCD), McDonald's, America's favorite fast food chain, plans to offer free McCafe coffee to customers. I guess sales of Big Macs, their iconic burger, have been down with more Americans wanting to eat healthier and with healthier options more readily available. McDonald's plans to give away free coffee during the breakfast hours which usually ends around 10:30 am starting today thru September 29. You can definitely get your caffeine fix for free everyday for 2 weeks! Now the coffee at McDonald's may not be as good as Seattle's very own Starbucks or Peet's coffee, but you definitely can't go wrong when it's free and you need that one cup of joe that will get you started in the morning. Who doesn't like the smell of fresh brewed coffee in the morning? It sure smells better when it doesn't cost anything! Although people think of burgers and fries when it comes to McDonald's as opposed to coffee, McDonald's coffee has actually improved in the last twenty years when they used to come in those small white Styrofoam cups. So the next time you go to McDonald's for an Egg McMuffin for breakfast, do yourself a favor and order a free McCafe coffee to go with it. Get it now while this promotion lasts!